Scientists at the University of Southampton are to develop and trial a new wearable technology to help people who have had a stroke recover use of their arm and hand. Led by Professor Jane Burridge, the team will create a wireless sleeve, which will provide automatic, intelligent information about muscle movement and strength while patients practice every-day tasks at home. Jane Burridge, Professor of Restorative Neuroscience at Southampton, comments: “About 150,000 people in the UK have a stroke each year and, despite improvements in acute care that results in better survival rates, about 60 per cent of people with moderate to severe strokes fail to recover useful function of their arm and hand. 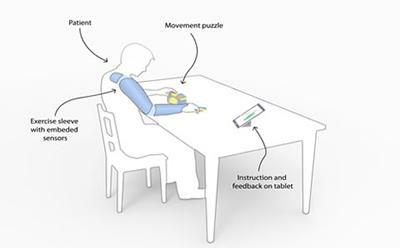 The same sleeve and computer tablet technology, but using different software and user-interfaces, will provide therapists with important information for clinical decision-making, treatment and progress and therefore increase efficiency and effectiveness of therapy. The project is entitled M-MARK and is a collaboration between the University of Southampton and Imperial College London and is led by Professor Jane Burridge in the Faculty of Health Sciences. The sleeve will be trailled at North Bristol NHS Trust and Portsmouth Hospitals NHS Trust, and two medical technology companies. Maddison, who lead on the commercial design of the M-MARK and Tactiq who lead on the electronic assembly, safety testing and CE marking.